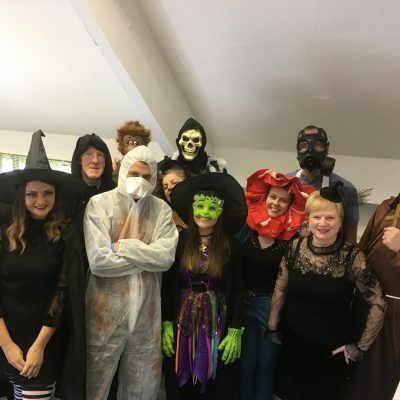 Continuing their support of the road safety charity Brake, the team at JMDA’s Headquarters held a spooky Halloween baking and fancy-dress event. All cake entry donations will go straight to the charity, who support victims of road traffic accidents. Never ones to pass on an exciting dress up event, sweet-toothed members of the team embraced the recent Halloween baking challenge. The team created a feast of ghoulish, spooky themed treats with all proceeds raised going to their chosen charity for 2018, Brake. Keen to put their creativity skills to the test, the team embraced the opportunity to design, bake and decorate a selection of homemade treats, eager to be crowned the latest ‘Brake Baker’. The team’s Halloween baking event is the latest event being held to raise funds for Road safety charity Brake. Besides various cake baking events, Philip and Tom from the team raised an impressive £350 for the charity by completing an exhilarating zip line challenge in July. The team also embarked on a gruelling virtual fitness race to their office in Shanghai China at the start of 2018. Setting themselves the target of collectively travelling the 5751 miles to Shanghai, the team are working hard to complete the challenge before the end of the year; and it doesn’t stop there! The team have even more fundraising ideas up their sleeves for the remaining months of 2018 including participating in Brake’s Road Safety Superhero Day on 23rd November. Designing their own superhero costume and super powers, the team will come to work dressed as superheroes to help raise awareness of road safety. JMDA look forward to announcing their fundraising total for the year and making their final donation to Brake in December. To view pictures of the team’s Halloween fancy dress and baking day, please visit the galleries page of the JMDA website. For more information about JMDA Design and their product design services please call +44 (0) 1386 426100, or email [email protected].